Lately I feel like the universe might be playing with more – or maybe its just another bright red super moon that I can’t see from all the rainy nights in Greensboro. Speaking of rain, last Friday after a long week of work, I ran to the market to pick up some groceries to make chili for friends. In line at the store, I offered the guy behind me to jump ahead because he only had one item – a bright green juice drink. He kindly accepted my offer and before we both could think, the cashier started ringing up my cheese with his drink. I quickly asked her to cancel those items but instead he insisted to pay for my cheese. The story seems insignificant three days later, but in the moment, I was reminded that the world can be tricky and thoughtful even on the gloomiest of days. So I’m making the most of the rainy days ahead. 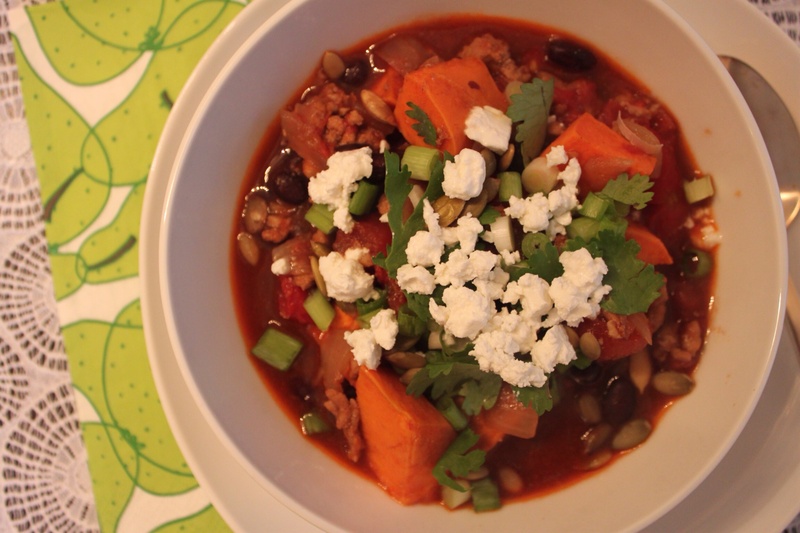 Here’s the simple rainy night chili I made – packed with ground turkey and sweet potatoes. I suggest topping it with some friendly feta cheese. Toss the sweet potatoes with 2 tablespoons of the olive oil and spread them out on a parchment-lined baking sheet or baking dish. Evenly sprinkle with a pinch of salt and roast, stirring now and then, until soft, about 20 minutes. Set aside. Meanwhile, heat the remaining 2 tablespoons of olive oil in a large heavy-bottomed pot and set over medium heat. Add the onion, garlic, cumin, pimentón (paprika), chili powder, and a big pinch of salt and cook, stirring now and then, until nice and soft but not too browned, 8 to 10 minutes. Add the turkey to the pan and cook, stirring now and then to break it up, until its liquid has been released and has evaporated and the meat is nicely browned, about 20 to 25 minutes. Add the tomatoes and a large pinch of salt to the pot and turn the heat to high. Add 1/2 cup of water to the pot. Once the mixture comes to a boil, turn the heat to low and let the chili simmer for 20 minutes. Use the back of your wooden spoon to crush the tomatoes as they cook. Add the beans and the reserved sweet potatoes to the chili and continue to simmer for another 15 minutes, just to let all the flavors come together. Serve with chopped scallions or cilantro on top.